Is meditation worship? Is it a prayer? Is meditation related with any religion? No. All of these questions should be answered in one word: No. In the simplest words, the meditation is a process that settles down the clouds of thoughts roaming in our head. Thereafter we can perceive the clear sky; the sky we can name it as our consciousness or soul or whatever name we prefer to give. Human mind is like a flowing river, full of water, full of thoughts; and full of disturbing dust, too. The progression of meditation would make the flowing water at standstill; and allow the dust to settle down at the bottom of the river. In such a state of mind, we are at the best of our abilities experiencing ourselves. We skip near to experiencing our consciousness. In simple words, by doing meditation we come nearer to our inner-self. "OSHO. Never Born, Never Died. Only Visited this Planet Earth between Dec 11 1931 – Jan 19 1990." OSHO, formerly known as Rajneesh, was is an enlightened mystic who taught meditation in its newer form. He had traveled around the world and had tried to tell us what the meditation spirituality are in reality. If we hear him we would feel that there is no wonder why his vision, wisdom and humor is capable to touch the lives of countless people around the world. OSHO About Our Mind: Osho said that our mind, or the stock of our knowledge, is not ours in fact. It is just a collection of the borrowed things. We borrow from our parents, teachers, gurus and other wise men, and even from the stupid persons. Out knowledge is just like the writing done on our mental slate, by others collectively. These writings brand us as Hindu, Christian, Muslim and like that. But the consciousness is a different thing. Our consciousness is one and untainted. It is so pure that it cannot be segmented into groups like Hindu or Christian. OSHO had given thousands of discourse which include the understanding of the old sources of knowledge like the Bhagavad-Gita to Buddhism, from the Bible to Zen. On every section of these sacred scriptures, he would talk with such a freshness and newness that his listeners are touched as never before. OSHO About Feminine Mind: Osho said that, "The feminine mind cannot have a sense of time. It is the male, aggressive mind who is time-worried, time-conscious. They are totally different. The feminine is not in any hurry — there is no hurry.". he said the the woman hardly wants to run upto a destined point. And for that reason women cannot become great leaders, great scientists, great warriors. It is because women have sense of achievements in their own, they believe in here and now, and not in a future date, and for that reason the women flock look more satisfied than the men. OSHO Rajneesh was born in in India on December 11th, 1931. From his early years he had tried communicating what the qualities of consciousness and awareness are and how that can be realized within ourselves. His penetrating insights often startled all who lived in his surrounding. He would talk about the source of human suffering in almost every aspect of life. osho, originally uploaded by sivangogh. Sudden enlightened only at the age of twenty one. In his discourses he would like this: “You are the Buddha. Only you have forgotten that yo are. " He had travelled throughout India and the world, giving discourses before huge crowds, challenging all the existing religious beliefs. OSHO And Mediation : OSHO said that the traditional meditation techniques of sitting and watching the mind are not enough in the changed circumstances and environment of the modern world. We have to do some changes in that techniques to suit it for us, as we are accustomed to mechanical patterns that it takes enormous energy and strength to break them down and make us getting the benefits of meditation. Meditation is state of no-mind. Until there is mind, one cannot be in the state of meditation. He invented some new methods of meditation in his Asharma at Pune, India and Oregon, USA. 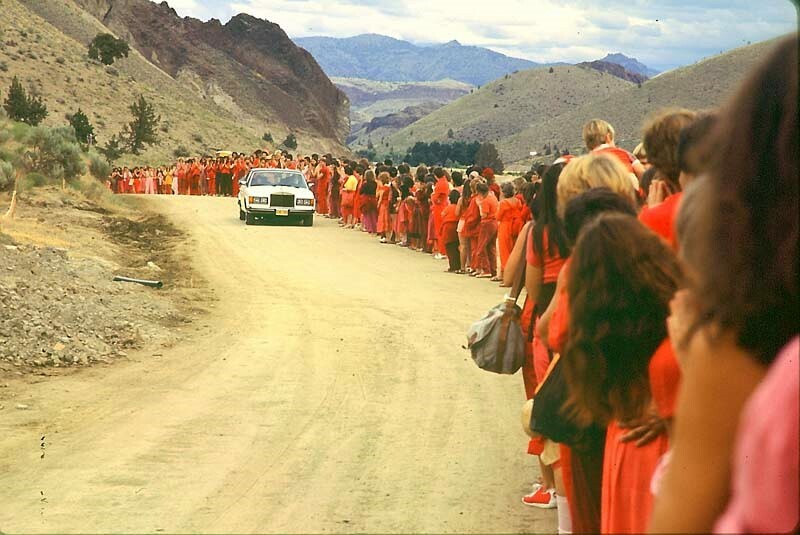 After coming in USA in the year of 1981, OSHO developed a meditation center in a 64000 acre in Oragon, USA. He developed this place that was formerly known as "The Big Muddy Ranch". OSHO left this mortal world on on January 19, 1990. Why to Meditate : It is our experience that whenever we do not feel to have a smile, we do so in front of others. When we feel some anger, we show false compassion. We are not behaving; we are just acting out of our falsehood. This prevents us from having the real experiences in our life. We are just becoming victims of the suppressed emotions. If we sit silently and meditate, we would start knowing about the suppressed emotions. Everything would start coming out and out mind and consciousness would be cleaned. Our mind is the most wealthy mine. We hardly dig out the inner wealth our mind can deliver to us. There are eight ways for getting salvation of the soul, as per Ashtanga Yoga system; and the ‘dhyan (meditation)’ is one of the eight paths. Until the worries dance within our cerebral dome and the discomfort rests embedded in our psyche, we would not be at ease. To feel at ease is our natural state, but our speedy life distorts everything that is peaceful. As the doctors also advised to practice it, the meditation is now the most modern health management tool. Every human mind is so unsteady. Our desires make us so wandering. If we can understand the science of the desiring mind, we can build up a nice road to real happiness. And meditation is the process to build up such a way; it is like cultivation of calm. Benefits of Doing Meditation : Once the flow of energy is focussed on one activity, naturally the power to concentrate our mind tends to be going on higher side. While doing meditation we feel quite relaxed. A practitioner of meditation would experience the consumption of oxygen, resulting in lesser flow of blood. It would result in reduction of the rate of heartbeats. In long run this would help in strengthening of our heart and decreasing the possibility of any sudden damage to it. Those who suffer from the problems regarding heart, their heart remain less tolerance to the exercises they require to do. A spell of meditation for 20 minutes a day would show positive results for such heart patients, as meditation is supposed to give rest to the heart. The most useful benefit of doing meditation is that the regular habit of meditation would increase general strength of human body resulting in the considerable improvement in the immune system. How to Meditate : Meditation is an act while doing it we remain in a mode that would lead us to experience the presence of our consciousness. ‘How to do it’ is not a major question. One can sit in any posture he or she feels comfortable. Generally a devotee would prefer a sitting posture. Some might prefer the sleeping pose, too, but it may result in sleep. In that case, too, it is better to have such a meditative sleep. Meditation is the best option to let the mind act naturally. Postures in Meditation : Generally the devotee would sit on yoga mat while doing meditation. The are certain sitting postures devised by various schools of yoga. Some gestures of hand and fingers are also recommended for getting maximum advantage from dong meditation.